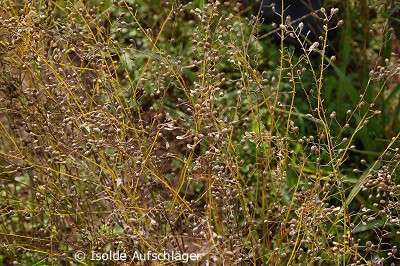 Due to their high content of oil, flax seeds belong to the group of the so-called oilseeds. Some budgies and other pet birds like to eat flax seeds. If one serves these seeds in small quantities in addition to the daily seed mixture, the birds can benefit from the nutrients of these healthy small seeds. But please note that oily seeds should never make more than 5% of the daily diet of a small bird like a budgie. Also bear that in mind if you offer your birds other oilseeds. All together, all oilseeds should not make up more than 5% of the total amount of food. One should buy flax seeds in shops that offer naturally grown grains (without pesticides or herbicides). Due to their high content of fat, oilseeds can be stored only for a short period, they become rancid very quickly. That's why you should buy flax seeds in small quantities only. 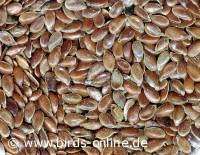 Important note: Unlike many other seeds mentioned in this subcategory of Birds Online, flax seeds are not suitable for making sprouted seeds. The reason is simple. Soaked flax seeds are covered with a sticky, slimy surface and most birds absolutely don't like this mucus even though it is not dangerous for their health.